The mouth of the Jones Falls in Baltimore was the most obvious place to stop trash before it got to the harbor, but how? Enter the Baltimore trash wheels. The cute names and big cartoon eyes were added to the trash wheels to help promote public awareness. John Kellett is an avid angler, boat builder, conservationist, and inventor of the Trash Wheel. He grew up on a farm in Gettysburg, PA. Starting in 1989, for nearly 20 years he worked in various capacities at Baltimore’s Inner Harbor. John’s skills as a boat builder prepared him for his job at Living Classrooms restoring skipjacks and teaching young people the art of woodworking. He was also director of the Baltimore Maritime Museum. Part of his job was to take care of the historic ships moored in the harbor, including the U.S. Coast Guard Cutter Taney and the U.S. Submarine Torsk. During his days working along the waterfront, Kellett couldn’t help but notice all the trash in the harbor. The constant “parade of trash” as he calls it, comes pouring down from swollen streams and overflowing storm drains, especially after a rain event. Seeing tourists cringe in disgust at the unsightly mess compelled him to take action. The mouth of the Jones Falls near the MECU Pavilion (formerly Pier Six Pavilion) was the most obvious place to stop the trash before it got to the harbor, but how? John’s initial idea was to build some sort of floating hay-baling contraption, but the trash didn’t need to be baled; it simply needed to be collected. Then, he came up with the idea to make a trash wheel combined with the features of a hay-pitching machine. The wheel would mostly be powered by the natural flow of water, an ancient idea for a present-day application. During high water situations, the swift current moves the wheel faster. During low water conditions, solar power is used to supplement the energy of the water flow. Soon John’s ideas took shape, and by 2008 the Abell Foundation agreed to fund a prototype. The first design resembled a boathouse sitting on a barge. The invention was tested in the harbor for a year, and the concept was proven. One of the lessons learned was that the device needed to be bigger in order to stand up to all the trash and debris, not to mention the incredible flow of water, especially during a flood. One big storm could produce as much as 100,000 pounds of trash. Before long, the trash wheel evolved into a more modern design with solar-powered panels and remote control operation via WiFi. The first fully functioning trash wheel known as Mr. Trash Wheel, was launched in May 2014. It sits at the mouth of Jones Falls next to the MECU Pavilion and is seen by millions of people every year. Here’s how it works: Trash flows down Jones Falls and is funneled through containment booms to a fixed ladder-type conveyer which is run by the big wheel turned by the water flow. 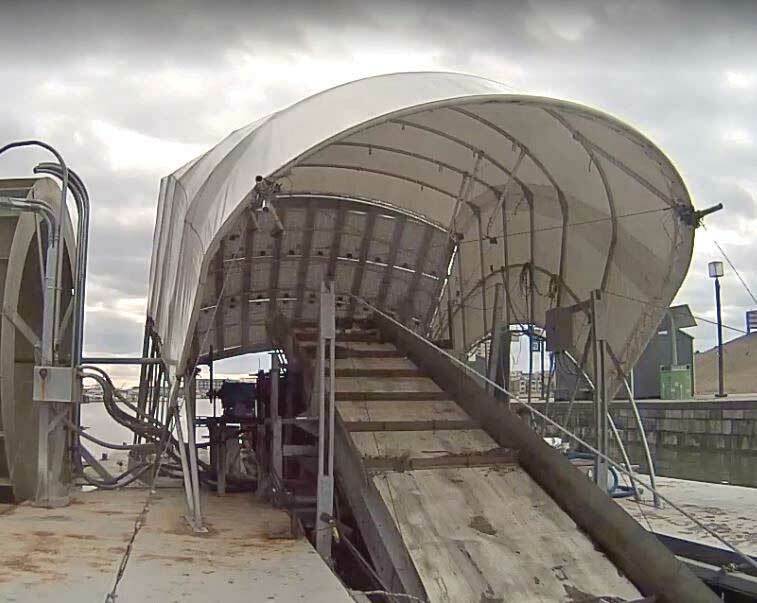 The trash is dumped from the conveyer into a garbage bin which sits on a separate floating barge under cover. Cameras mounted on the trash wheel similar to a home security system are monitored by Kellett or one of his seven employees. When the dumpster needs to be changed, it is. When a big log jams up the conveyer, which doesn’t happen often, workers can see the problem on the camera and go fix it. So far, the most unusual thing ever picked up by the trash wheel was a four-foot-long African python. That’s right! In August 2015, a python was found curled up alongside the conveyer. The curious catch became a funny news story. Local beer makers from Peabody Heights Brewery named an ale after the non-native snake called Mr. Trash Wheel’s Lost Python Ale. The second trash wheel, named Professor Trash Wheel, was launched in December 2016 at Harris Creek in Canton. Harris Creek is not as big as Jones Falls, but it drains much of East Baltimore. Almost all of the trash coming from that location consists of cigarette butts, Styrofoam cups, and plastic bottles. Captain Trash Wheel is the third trash wheel in the harbor. As of June 2018, it was set up in Masonville Cove which drains the Curtis Bay area. The cute names and big cartoon eyes were added to the trash wheels to help promote public awareness. Ninety percent of the trash collected comes when it rains. Maryland received record rainfall in 2018. Over 300 tons of trash were removed from the Inner Harbor, almost double the annual average. About 70 percent of the rubbish is organic material such as sticks, leaves, and logs. Still, that means 90 tons of trash such as plastic bottles, soda cans, and snack wrappers are being removed from the harbor. Baltimore is not unique regarding a trash problem. Sadly, some places in the world make the city look good by comparison. Kellett and his partner Daniel Chase are working on cleaning up many other areas, including New York City and LA. 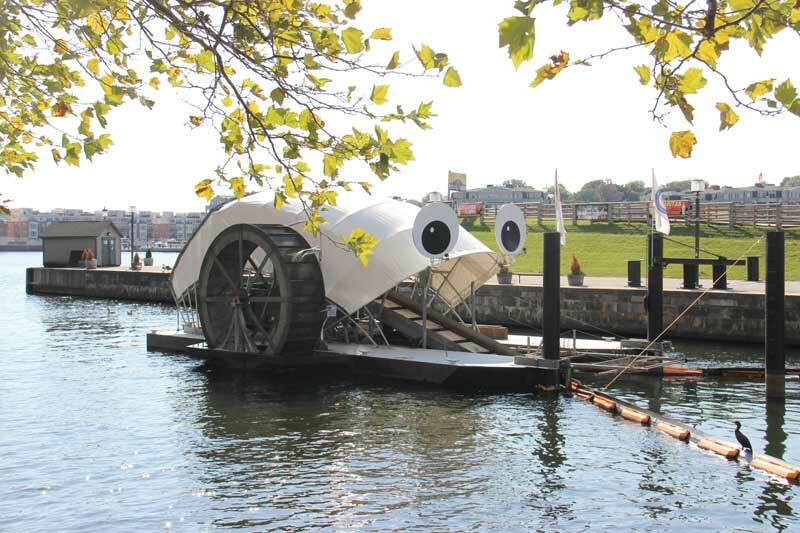 You can learn more about the trash wheels, and check out the live feed at Waterfront Partnership of Baltimore.